Delivers up to 2X more runtime, 20% more power and 2X more recharges than standard lithium-ion batteries. The M18 REDLITHIUM 2.0 Compact Battery Pack features superior pack construction, electronics and performance to deliver more work per charge and more work over pack life than any battery on the market. It offers 2.0 amp-hours of runtime. With Milwaukee durability built into each pack, this battery runs cooler and performs in climates below 0F/-18C. Its compact, lightweight design fits in tight work spaces and reduces user fatigue. 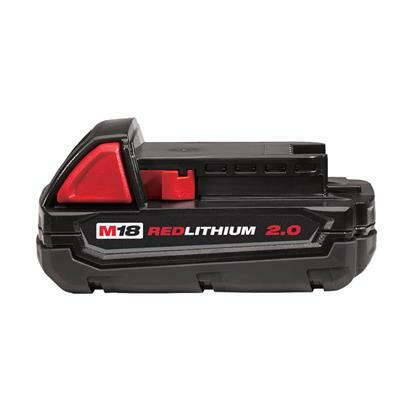 Managed by Milwaukee's exclusive REDLINK Intelligence, the battery features overload protection to prevent you from damaging your cordless power tools in heavy-duty situations, while the discharge protection prevents cell damage. The temperature management system and individual cell monitoring help maximize battery life. Switch to the REDLITHIUM 2.0 Compact Battery Pack to instantly upgrade the runtime and durability of your Milwaukee M18 cordless tools.